Unprotect Worksheet method in VBA is used to remove protection from the worksheet. If you forgot the password, you cannot unprotect the worksheet. Always better to note down in safe place. We need to Unprotect Worksheet at the beginning of the procedure to do any changes to the Worksheet. Why we need to Unprotect a Worksheet using VBA? When we use Unprotect Worksheet Method in VBA? 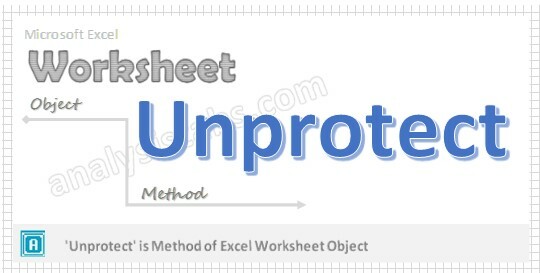 Unprotect method of Worksheet object has no effect if the Worksheet is not protected. It removes protection from the Worksheet. We have to use unprotect method of worksheet object to remove password protection from the worksheet. If you forgot the password, you cannot unprotect the Worksheet. Here is the syntax to Unprotect Worksheet using VBA. Where Password is an Optional parameter. It specifies a case sensitive password to unprotect the Worksheet. If worksheet is not protected with password then you can ignore this parameter. In the above syntax we are using ‘Unprotect’ method of Worksheet object to unprotect the Worksheet. Please find the below example, It will show you how to unprotect the Worksheet without password. Explanation: In the above example we are unprotecting the Worksheet without password by using ‘Unprotect’ method of Worksheet object in the worksheet named ‘Sheet1’. When we are unprotecting the same worksheet it won’t ask any password to unprotect the worksheet. Here is the example to Unprotect the Worksheet with password. Explanation: In the above example we are unprotecting the Worksheet with password by using ‘Unprotect’ method of Worksheet object in the worksheet named ‘Sheet1’. When working with macro or code has password protected, if you want to do any changes in the code first you have to unprotect the password at the beginning of the procedure and at the end of the procedure you have to protect it again. While unprotecting same worksheet it will ask for the password to unprotect the worksheet. Press ‘F5’ to run it or Keep Pressing ‘F8’ to debug the code line by line and check how the Worksheet has Unprotected.